JurassiCal Liquid is a concentrated (160,000 ppm) phosphorus free source of calcium for reptiles and amphibians. Herbivorous and carnivorous diets are frequently calcium deficient and phosphorus rich. Thus, it is of no benefit to use a calcium supplement containing phosphorus. 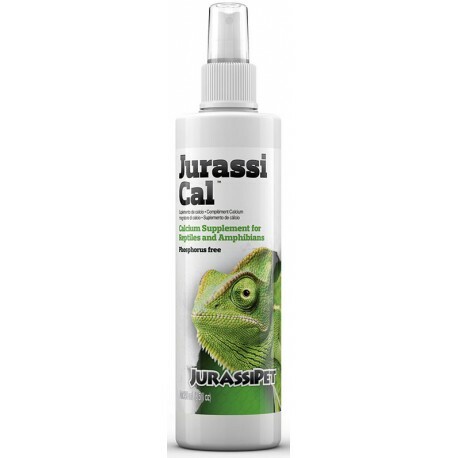 JurassiCal Liquid is a concentrated (160,000 ppm) phosphorus free source of calcium for reptiles and amphibians. Herbivorous and carnivorous diets are frequently calcium deficient and phosphorus rich. Thus, it is of no benefit to use a calcium supplement containing phosphorus. Ideally the dietary calcium to phosphorus (Ca:P) ratio should be no less than 1.2:1 and is ideally maintained from 2:1 up to 8:1 (depending on the species)*. Lack of calcium in the diet can lead to metabolic bone disease and shell deformities and soft shells in turtles and tortoises. Many commonly fed fruits and vegetables lack adequate amounts of calcium. Likewise, in most invertebrate species, calcium is inadequate (less than 0.5 mg/kcal). In most cases, invertebrate prey will require calcium supplementation. In addition, vertebrate prey often falls short of the recommended 2 : 1 ratio. In such cases, calcium supplementation should be considered. JurassiCal is also Vitamin D3 free. Although Vitamin D3 is necessary for calcification (biological incorporation of calcium into bone, shell, etc. ), excessive amounts can be toxic and may lead to hypercalcemia. To ensure compatibility with JurassiVite (which does contain Vitamin D3 in the safe cholecalciferol form) and to aid in maintaining the correct calcium to phosphorus ratio, JurassiCal does not contain either phosphorus or Vitamin D3. * Mader, Reptile Medicine & Surgery, 1996.